We crossed one off the Bucket List yesterday. 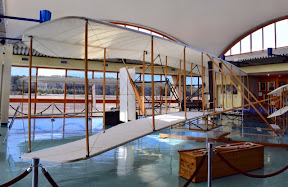 Fred has wanted to visit Kitty Hawk for a long time. 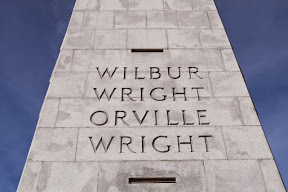 We have vacationed many times in southern Virginia and with each visit we discussed how close we were to the Wright brothers site. With each visit we decided that we didn't want to make the long drive and went to the beach instead. Spending a day in the water on Sandbridge is hard to give up. Yesterday was sunny and a Springlike 53 degrees in the Outer Banks. We left out site at the Elizabeth City Coast Guard Base and headed for Kill Devil Hill. 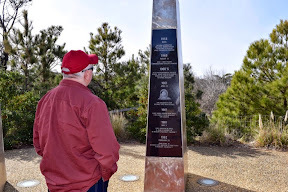 We stopped at the Currituck Welcome Center to visit North Carolina's Monument to a Century of Flight. The Stonehengelike spires are made of polished metal. Each one commemorates specific events in the history of aviation. The National Memorial is located 6 miles south of the welcome center. It is a large open area with walking paths and a number of monuments. We arrived just in time to attend the Park Rangers presentation about the Wright brothers story. I was amazed to learn that these self taught bicycle mechanics solved the 3 principles of Lift, Thrust and Control. They created mathematical equations and a design that provided a foundation for modern avionics. 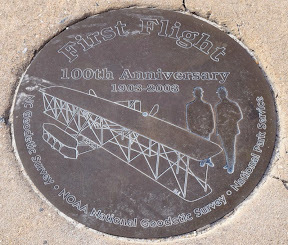 In 2003 on the 100th Anniversary of the 1st flight the National Park Service placed a geodetic marker next to the first flight Boulder to commemorate the 12 second 120 foot flight made by Orville Wright. 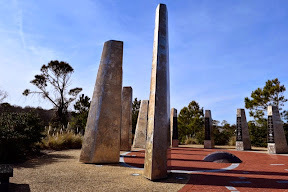 The Memorial is a large area that encompasses Kill Devil Hill. 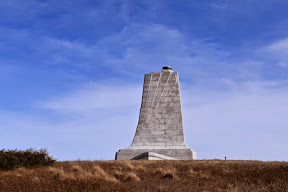 A large monument dedicated to the Wright Brothers sits on top of the hill. Our reward for climbing to the top was a spectacular view of the OBX beaches.